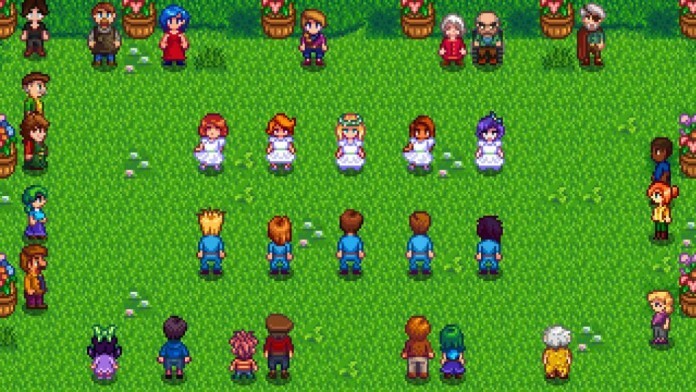 There are 10 characters that you can eventually marry in Stardew Valley – and a lot more NPCs that you can offer gifts to in order to increase your relationship/friendship with them – but in today’s guide we will focus on the love aspect and share with you all the details you need to know on how to get married in Stardew Valley, including the items that you should offer as gifts to all potential marriage options in order to increase the hearts number. 1. Make sure you have the Mermaid Pendant. You can buy it for 5,000 coins from a Mysterious Man which will randomly appear at the East Pier Beach on a rainy day, AFTER you have upgraded your house. 2. Increase your relationship with your chosen character to 8 hearts. 3. Afterwards, gift your chosen soulmate a Bouquet, and this will raise their hearts level to 10, and will trigger the Wedding event in three days. So basically, this is what you have to do – and it’s easy in theory. It takes some time to build the relationship, but the good news is that once you are married, you can still increase your relationship with other characters, you can still visit Penny and you will always have your spouse help you around. Plus, you can get two children! It’s fun and it’s totally worth it. 4. Maru: Strawberry, Rhubarb Pie, Cauliflower, Diamond, Gold Bar, Quartz, Iron Bar, Copper Bar, Crocus. Note: they might like and/or love other items, but the ones listed above are guaranteed loves or likes! This would be it. Don’t hesitate to let us know which character have you chosen to be the one you’ll spend the rest of you in-game like with!